I know this might seem like a cheap trip, but here is today's view from home. Today's photo does not do the actual experience justice however. I really am writing a blog post about the biggest news story in the Adirondacks so far this year. Although some of you may think that statement is a cheap trick to tease readers like they do on CNN with 'stayed tuned for coverage on how to live to be 125! ', so you watch the pitiful news coverage on offer, I really have a work in progress. 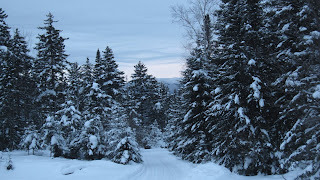 As my regular readers already know, it is a busy time of year for skiing realtors and writers in the Adirondacks. I will be posting a nice story later.